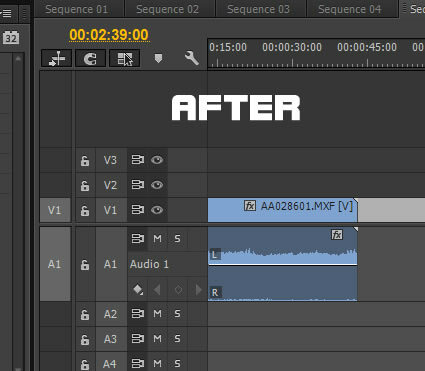 Before, two separate channels of audio would be on the timeline (A1 & A2) when I moved it from the project window. Now, both channels are in A1 and I can't figure out how to get it back to the old way. To clarify, was that before and after an update to premiere pro cc? There used to be a "Break out to mono" command. Maybe still is. Select the track and either right click on it or go through the menus and it should be somewhere. Sorry, don't have CC; still on PP CS5. Edit: It's under Clip/Audio Options/Breakout to Mono in CS5. It might just put these into your Project Panel and you might have to drag these onto your timeline. Last update was 63 days ago. Everything was working fine since then. It still works ok on the old projects. I think it has something to do with the way Premiere is importing the audio files. I've tried various options in PREFERENCES > AUDIO but nothing seems to work. Then drag that footage into a sequence and it should have 2 audio tracks. You can also go to edit -> preferences -> audio and change the Stereo Media option to Mono. 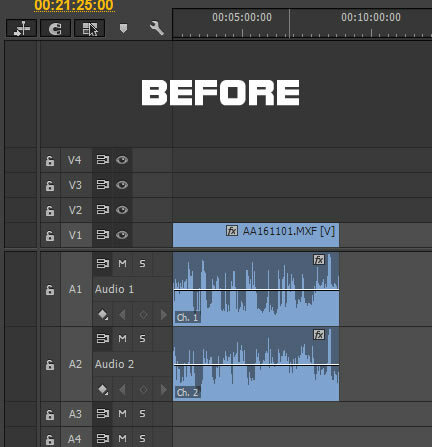 That should force files with stereo audio onto 2 tracks for any footage that you import in the future, don't think it'll affect footage already in the project. Once you've broken them out to two different mono channels, is there anyway to get them back to one stereo clip?